iSOCRATES DatalyticsTM is iSOCRATES’s own cloud- based, on-demand, unified, media and marketing Business Intelligence platform. DatalyticsTM provides Marketers, Agencies, and Publishers with Data collection and Integration of multiple data sources for Analytics and Reporting. DatalyticsTM includes standard and custom dashboards, scorecards, alerts, analysis, and reporting tailored to individual needs. 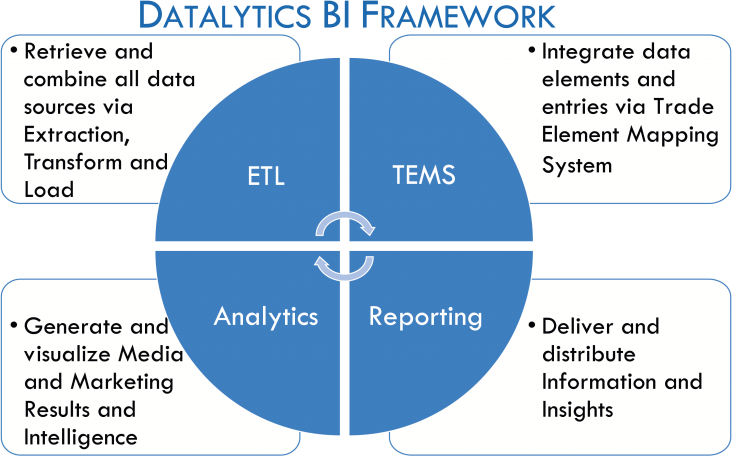 The iSOCRATES DatalyticsTM Platform comprised of four major components: Data collection and integration (ETL), Trade Element Mapping Solution (TEMS) to properly connect all the data together, Analytics and Reporting. DatalyticsTM ETL is a purpose built, universal omnichannel data collection, import, source mapping and integration solution across digital Marketer, Agency and Publisher marketing systems and technologies. It collects data from all sources including online and offline data via multiple methodologies. DatalyticsTM Advertiser ETL retrieves and integrates Advertiser cross channel campaign data from ad technology, brand safety, ad server, DMP, email, social, DMP, conversion, and measurement to manage pacing, performance, goals, conversion, targeting, and ROAS. property revenue performance, and yield management. and marketing data dynamically through automated solution mapping and coding to integrate across DSP, brand safety, viewability, ad server, email, social, search and conversion (online and offline) data. DatalyticsTM Publisher TEMS integrates direct campaign, ad server, secondary demand, header bidder, SSP, site and viewability data across data sources to deliver integrated DatalyticsTM Analytics and Reporting. and optimization business intelligence, data visualization, and reporting solution for Advertisers and Publishers. Publishers, Advertisers and Agencies login to the secure cloud-based solution to provide management, sales, operations and on-demand analytics, dashboards, scorecards and alerts. All site, app, display, email, social, video, native, and more campaign, safety, and audience Ad Tech and Mar Tech data sources are integrated and available for business intelligence, analysis, and reporting in easy to access and understand tools and dashboards. DatalyticsTM Analytics and Reporting displays for analysis, dashboarding, alerting, scheduling, and distributing you campaign and/or site ad revenue, costs, opportunities, optimizations, KPIs and measures.